A sparkling collection of low lying, coral isles, sand cays and atolls make up 5 separate groups of Outer Islands which include one of two of Seychelles' UNESCO World Heritage Sites, amazing 'Aldabra', the largest raised coral atoll on earth. The other, the fabulous Vallée de Mai where the extraordinary Coco-de-mer nut grows on ancient palms, once earned Seychelles the reputation for being the original site of the biblical Garden of Eden. 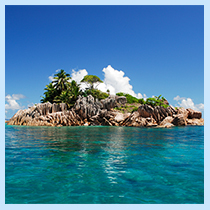 Seychelles’ enviable climate is always warm and without extremes. In this tropical haven the temperature seldom drops below 24°C or rises above 32°C. All but the remotest southern islands lie comfortably outside the cyclone belt and the average daily period of sunshine is in excess of 7 hours making Seychelles’ a year round destination for sun worshippers and beach lovers. The climate is healthy and many tropical diseases such as malaria and yellow fever are unknown. Vaccinations are unnecessary. March and April are the hottest months but shade temperatures seldom exceed 30°C and during the coolest months of July and August may drop to as low as 21°C. The south-east trade winds blow regularly from May to October when the temperature is slightly lower and the atmosphere less humid due to the mild sea-breezes. The north-west monsoon prevails from December to March which become the hottest and wettest months with humidity averaging 65%. The sea is roughest from May to October; consequently this time of the year is less suitable for fishing. 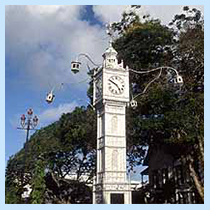 Seychelles Standard Time is 4 hours ahead of Greenwich Mean Time (GMT+4). Seychelles does not operate Daylight-Saving Time. 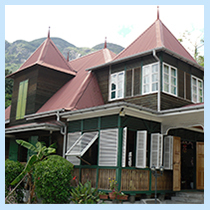 Seychelles is a comparatively young nation which can trace its first settlement back to 1770 when the islands were first settled by the French, leading a small party of whites, Indians and Africans. The islands remained in French hands until the defeat of Napoleon at Waterloo, evolving from humble beginnings to attain a population of 3,500 by the time Seychelles was ceded to Britain under the treaty of Paris in 1814. 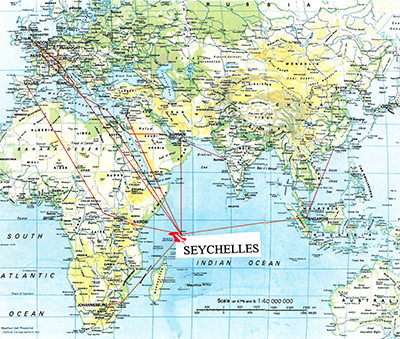 Seychelles achieved independence from Britain in 1976 and became a republic within the commonwealth. Following a period of single party rule by the government of Mr. France Albert René, on December 4, 1991, President René announced a return to the multiparty system of government, 1993 saw the first multiparty presidential and legislative elections held under a new constitution in which President René was victorious. President René also won the 1998 and 2003 elections before transferring the Presidency to James Alix Michel in June 2004. Photo copyrights: STB Team, Leisure and Business 2012 - SEYCHELLES, other copyright 2013 Honorary Consulate of the Republic of Seychelles in Hong Kong. All Rights Reserved.